������ Uthai Thani is a province abundant in natural resources, such as forests and wildlife. “Huai Kha Khaeng Wildlife Reserve” here was proclaimed a Nautral World Heritage Site on 13 December 1991. The reserve has jungles, forests, plains, many streams, and most importantly, a number of rare and endangered animals. Khao Plara is a border between Ban Huai Sok in Amphoe Lan Sak and Tambon Khao Bang Kraek in Amphoe Nong Chang. Khao Plara is a large steep mountain with a height of approximately 598 metres. The forest is quite unspoilt. Visitors have to travel by foot and climb up the mountain for 900 metres, taking about 2 hours to get to the top of the mountain, where they can admire the beautiful sight of its topography. On the top of the mountain, a large plain lies covered with Makha – Afzelia xylocarpa - forest. Archaeologists divided the groups of paintings on Khao Plara into 4 groups. Group one are pictures of humans with pets (believed to be dogs). Group two are pictures which show the relationship between human and cow, catching the wild cow and the way to bring it back to take care of it. Group three are pictures of rituals. Humans in the pictures had certain accessories, different from others with animals that look like monkeys. Group four includes miscellaneous pictures, most of which are pictures of animals. The coloured paintings were elaborately made and look more life-like than other places. For travellers who would like to climb up Khao Plara: it is suggested that they should prepare drinking water, and put on suitable trainers because the path is made of sliding small grains of rocks. It is recommended that they should carry only necessary things. To get there, take Highway 333 from the city, passing Amphoe Nong Chang. Then, take Highway 3438, Nong Chang - Lan Sak route for about 21.5 km. Khao Plara is on the left. Turn left along an asphalted road for about 7.5 km. Otherwise, take a bus (Uthai Thani – Lan Sak) then, take a bus from Lan Sak to Huai Sok Intersection and hire a motorcycle to the Khao Plara Non-hunting Area. Mueang Boran Bueng Khok Chang, Tambon Phai Khiao, is surrounded by a city ditch and earth wall. Ancient ruins, pottery, stones for pulverizing herbs, metal tools, and yellow beads, as well as three ancient Khmer inscription stones were found here. At present, this historical site is a forest garden, covered with large trees, but the city ditch has become shallow. The discovered artefacts are kept in the Local Historical and Cultural Museum, in the Non-formal Education Centre, Uthai Thani, near the City Hall. To get there, take Highway 3221 from Amphoe Mueang, passing Amphoe Thap Than. Turn into Highway 3013, passing Amphoe Sawang Arom. Then, take Highway 3456 for about 14 km. bound toward Amphoe Lan Sak. There will be a stupa and a sign leading to Bueng Khok Chang on the left. This route leads through the old city of Bueng Khok Chang. Old City of Uthai Thani is located at Ban Uthai Thani Kao. It was the location of Mueang Uthai Thani since the Ayutthaya Period. Now the ruins still exist, such as Wat Hua Mak, Wat Yang, and Wat Kuti, while the surrounding areas have become rice fields. The temple which remains the same until now is Wat Chaeng. In this temple, there is a prang built in 1538 whose top was destroyed by the Burmese army. The latest repair was in 1985. The old ordination hall is small and has one door, in a style of the late Ayutthaya period. The stucco relief pattern of the prang and on the ordination hall’s gable were made by the same craftsmen. The mural paintings in the ordination hall were made after the latest repair, which depicts the duty of King Taksin the Great. Another remaining temple is Wat Hua Mueang which has ruins of an Ayutthayan-styled ordination hall and small ancient pagoda in front of the old ordination hall. To get there, from Nong Chang Market at Prasat Wet School T-Junction, drive along the route to Wat Nong Khun Chat. Turn right at the T-junction and drive toward the opposite direction to Wat Nong Khun Chat for about 1 km. until you arrive at Wat Chaeng. Wat Hua Mueang is 1 km. beyond from Wat Chaeng. Wat Uposatharam formerly named Wat Bot Manorom, is sometimes called Wat Bot. It is an old temple on the Sakae Krang Riverside, on Ko Thepho, in the Mueang Municipality area. From the municipal fresh market, cross the bridge to the temple which is on the east side of the river. The interesting things to see include mural paintings in the ordination hall and wihan, which were made in the early Rattanakosin era. The paintings in the ordination hall were elaborately made, depicting the biography of Lord Buddha from the time when he was born until he died. In the wihan, there are paintings of Lord Buddha, preaching to gods in Heaven and the scene when he was resolving to enter nirvana. On the upper part of the wall, there is a picture of a gathering of monks, switching with Phat Yot, a long-handled fan of an ecelesiastical rank, which seems to show respect to the principal Buddha image. On the outside wall in front of the wihan, there is a picture of Lord Buddha’s cremation and the picture of villagers’ ways of life along the Buddhist concepts. It is believed to have been made by craftsmen of a later time. In addition, inside Wat Uposatharam, there are other interesting things to see, such as Sema, a leaf-like boundary sign made of red stone, in front of the ordination hall, a cabinet to keep Buddhist scriptures and a storage closet painted with the floral Kanok vine pattern. In addition, there is a Bat, a monk alms-bowl, with the lid decorated with mother-of-pearl inlay which was given by King Rama V and made by Chang Sip Mu (the Ten Departments of Craftsmen), as well as a Hong - Hamsa or Swan - on top of the column. There are also many attractive forms of architecture to visit such as the Octagonal Mondop which is a combination of the Western and Thai styles and has a decoration made of stucco, looking like climbing plants on the window frames; a high-relief cement Buddha image which is situated outside the building; three chedis of 3 periods comprising hexagonal chedi of the Ayutthaya period, a chedi with twelve angles of the Rattanakosin period, and a bell-shaped chedi of the Sukhothai period; Uthai Phutthasapha Conference Hall which is a pavilion in a typical Thai style, used as a praying hall, having a gable with stucco relief decoration; and Phae Bot Nam, a floating ordination hall in front of the temple which was built to receive King Rama V when he visited the North Circle in 1906. It was formerly a twin raft-house with Cho Fa - a gable apex, and Bai Raka - a leaf-shaped roof-edging, like other ordination halls. On the gable, there is a circle with Pali scripts reading “Su Agata Te Maha Raja” which means Maha Raja - great king - comes well. Later, in 1976, it was repaired to be one 2-storeyed building, including a raised platform, with a hip roof. The circle was moved to place in the middle of the gable. This Phae Bot Nam is used in religious rites such as weddings, ordinations, funerals, and various merit-making occasions. Khao Sakae Krang is a mountain where you can use stairs from the temple court of Wat Sangkat Rattanakhiri to climb up to the top. Otherwise, take Highway No. 3220 for 4 km. Pass the provincial stadium and drive along the route to the top of the mountain where you can admire the beautiful panoramic sights of Uthai Thani. It houses the replica of Lord Buddha’s footprint, built in 1905 and moved from Wat Chantharam. In front of the mondop, there is a large bell which was constructed by Phra Palat Chai and the people of Uthai Thani in 1900. It is believed to be a holy bell which all tourists coming to Uthai Thani should not miss to tap. Near the mondop on top of the mountain, there is a statue of Somdet Phrapathom Borommahachanoknat or the Royal Father of King Rama I, whose name of birth was Thongdi. Later, he was designated to be Phra Akson Sunthonsat, a chief clerk of the Interior Department. In the Ayutthaya era, he was Chaophraya Chakri Si Ongkharak. After that, in the Rattanakosin era, King Rama I (who was formerly called Thongduang) promoted the relics of his father to be Somdet Phra Chanakathipbodi in 1795. The Statue of King Rama I’s Royal Father was cast in double life size, sitting on a seat. In his left hand, a sword of the position of Chaophraya Chakri is kept in the sheath and put on the left thigh. The statue puts its right hand on the right thigh. On his right, there is a Phra Mala Sao Sung, a royal hat without Yi Ka (bird feather), placed on a footed tray. He wears sandals. There is a ceremony to pay respect to the statue on 6 April of every year, at the same period when Suphannika or Fai Kham – yellow cotton trees, the symbolic flower of Uthai Thani, bloom all over Khao Sakae Krang. In the forest behind the mountain, approximately 200 metres from the statue, there is a world map pin, a tool for mapping, which was built in 1932. Wat Tha Sung (another name is Wat Chantharam) is at Mu 2, Tambon Nam Sum. It is an old temple from the Ayutthaya period. It was formerly called “Wat Chan” which is the name of an abbot. Wat Chantharam later was abandoned until 1789 when the monk Luang Pho Yai came here. Villagers asked him to become the abbot of the temple and he renovated it. The first location of the temple was on the bank of Sakae Krang River. The artifact of the place is a pulpit built by Luang Pho Yai that is opposite the temple. More buildings were later added by the monk Phra Ratchaphrom Yan Nen (Luang Pho Ruesi Ling Dam). The new convocation hall is beautiful with an ornately decorated interior. The inner windows and doors have pictures of angels. His Majesty the King presided over a ceremony to officially open the building. Surronding the building is a traditional columned wall. Images of Luang Pho Pan and Luang Pho Yai 3 times the actual size is at the corner of the front wall. Furthermore, the new site has a wide area as well as many pavilions with accommodation for meditation. The main hall is open during 09.00-11.45 hrs. and 14.00-16.00 hrs. daily. Getting There: From the city, take Road No. 3265 to the ferry at Amphoe Manorom, about 6 kilometres away. Wat Than Sung is on both sides. Hup Pa Tat is a large valley with an area of about 48,000 square metres. The mountain range surrounding the valley is a limestone range. Part of it is Khao Huai Sok that connects with Khao Pla Ra, about 1 kilometre away. The way up to the cave is a margosa forest. Upon reaching the cave mouth you will see a dark cave. After a walk of around 100 metres, you will emerge from darkness and see the way down to the valley. Looking around you will see a limestone mountain surrounded by high cliffs. This enables sunlight to reach the ground only at midday. Therefore, the valley has higher humidity than other parts and this contributes to a wealth of flora. The thick jungle features gigantic shrubs of the genus Excoecaria that are similar to prehistoric trees. Getting There: Use the same route as Khao Pla Ra. It is 300 metres before the mountain. Seub’s Shelter still remains the same like when he was alive. In the bedroom, where Seub ended his life, there is a table with many pictures of his daughter, labourers, and forest. Beside the table, a few pairs of shoes were put on the floor. Khao Hin Daeng Nature Study Route is approximately 6 km. long, taking about 4 hours to travel on foot. There are 18 points to interpret the meaning of the nature, including deciduous forest, deciduous dipterocarp forest, mixed deciduous forest, and dry evergreen forest, as well as a sight-seeing point, Pong Thian. After December, there are a lot of birds from various species, most of which are red-breasted parakeet and lineated barbet. Normally, tourists can travel on this route by themselves, using a manual provided at the headquarters of the sanctuary. For a guide, please contact Huai Kha Khaeng Forest Fire Prevention Unit in advance at Tel. 0 5651 3527. However, this natural route is closed in April. In the rainy season, it is difficult to drive through the entrance due to flooding on the laterite road. Accommodation: To stay overnight, contact the Wildlife Sanctuary Management Subdivision in person at least 20 days in advance at the Wildlife Conservation Office, Department of National Park, Wildlife and Flora. For further information, please contact Tel. 0 2561 4292-3 ext. 765 or Huai Kha Khaeng Wildlife Sanctuary, P.O. Box 7, Amphoe Lan Sak, Uthai Thani 61160 or Tel. 0 5651 9654. There are 3 permitted points for staying overnight. The first point is in the area of the sanctuary office, including 3 houses with a capacity of 10-30 persons and the training building with a capacity of 80 persons. The second point is at the Cyber Ranger Station, and the third one is at the Huai Mae Di Ranger Station. Wat Khao Wong is a temple in a valley. It has a beautiful two-storey Thai-style convocation hall. The area has been exquisitely landscaped. The monastery is the 13th of 19 branches of Wat Sangkhathan in Nonthaburi that are in places such as Chiang Mai, Um Phang, the United Kingdom, and India. The monastery was built in 1987 and has a total area of 320,000 square metres. The surrounding area is mountain and forest. The most striking feature of Khao Wong Monastery is the 4-storey Thai-style multi-purpose pavilion. Built almost entirely of wood, the pavilion has a pond in front with many fish. Around the pond is a garden of colourful flowers. The wood used in the pavilion’s construction was donated by locals and has been transformed into a work of architecture that retains natural qualities. The monastery has a monthly meditation class for those who are interested. Getting There: Use the same route as Phu Wai Cave. It is about 3 kilometres before reaching the cave (there is a cooperative store selling souvenirs and free accommodation for up to 200 persons). Pha Rom Yen Waterfall is in Ban Mai Rom Yen. The highlight of the waterfall is its uniqueness of being a limestone waterfall that falls from a cliff. It can be clearly seen from the road nearby. This beautiful waterfall flows from a small stream 4 levels up. It is about 100 metres high. The highest level is a stream that falls down to a pool on the second level. The highest level is the level that can be viewed from the entrance. The beauty of this waterfall lies in the fact that it falls down a high cliff, splashing into mist down below. The nearby area is bright green with moss and ferns. The surrounding nature provides cool shade for visitors. Getting There: From Amphoe Ban Rai, take Highway No. 3011 (Ban Rai-Phu Bon) to the entrance of Ban Mai Rom Yen, then turn right for around 2 kilometres. Then go on foot for 400 metres from the entrance to the waterfall. It is under the responsibility of the Cyber Ranger Station. It is situated near Cyber Village (Ban Sap Mae Bue), Tambon Khok Khwai, Amphoe Huai Khot, 86 km. from the provincial city. This multi-layered waterfall is formed by water from Huai Loi Choi which flows from a high mountain in Huai Kha Khaeng Wildlife Sanctuary. The waterfall at the higher level is called Namtok Loi Choi. In some parts, the water falls over a big rock so it is called Namtok Hin Lat. Below, there is an enormous water basin to receive the water which keeps flowing down continuously. In other part, the water squeezes through rocks to the basin, creating a beautiful high multi-layered waterfall. There will be a lot of water in September until early November. Huai Loi Choi will meet Huai Thap Salao. The waterfall is surrounded by a rattan forest with shady trees and leaves that change their colours in November. Shelters and facilities: There is one reception house which can hold 20-30 persons. Food service is not provided, so visitors have to prepare it by themselves. It is necessary to have a letter of permission from the managing department of the wildlife sanctuary because it is under the responsibility of Huai Kha Khaeng Wildlife Sanctuary. For further information, please call Tel. 0 2561 4292-3 ext. 765. To get there: Take Highway 3282, turn left at Km. 30, and drive into an unpaved road for 7 km. Travel on foot for another 900 metres. The entrance is a laterite road with sharp rocks all the way, passing many creeks. In the rainy season (August - October), it is not possible to drive along this road. It is recommended to take a 4 wheel-drive car. Otherwise, take a bus Ban Rai - Khlong Haeng from Ban Rai Market and get off at Ban Thonglang, at Km. 19. Then rent a two-rowed car. Wat Sankat Rattana Khiri is at the foot of Khao Sakae Krang at the end of Tha Chang Road in the municipality. Inside the main hall is “Phra Phuttha Mongkhon Sai Sit” or “Luang Pho Mongkhon”, an ancient bronze Buddha imae form the Sukhothai period in theMan Wichai posture. It is 1.5 metres wide and was made in the reign of King Lithai. 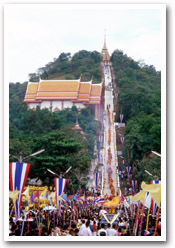 In the open area of the temple is a stairway ascending to the top of Khao Sakae Krang totaling 449 steps. At the peak is a pavilion with a multi-tiered roof housing a replica of Lord Buddha’s footprint and a large bronze bell built in the reign of King Rama V. It is said that this is a sacred bell that visitors to the province who does not ring the bell is like on who never gets to see the province. Getting There: From the city, take Road No. 3220 and turn left into the provincial staduum leading up the mountain. The distance is around 4 kilometres. Getting There: Take Highway No. 3221 (Amphoe Muang-Amphoe Thap Than) for 19 kilometres. The temple is located on the left about 1 kilometre before the Thap Than district office. Prehistoric colour drawings at Khao Pla Ra is another interesting tourist attraction of Uthai Thani. Khao Pla Ra is a mountain range with verdant jungles, no communities and natural water sources. It is also the home of numerous wild animals. It has truly lovely nature in the area around the cave and cliff in the southwestern part of the mountain at around 320 metres avove sea level. Colour cave drawings stretch for around 9 metres. These prehistoric drawings are of humans and animals in red and black. They show an agrarian society and are artistic expressions of people in ancient times. The drawings give insight into their lifestyle and homesteads. They are certainly invaluable as artistic heritage of the country. A number of earthenware pieces of three-legged pots and stone axes were also found in the area. Getting There: From the city, take Road No. 333 past Amphoe Nong Chang, then take Road No. 3438 (Amphoe Nong Chang-Amphoe Lan Sak) for around 21.5 kilometres. You will see the Pla Ra Mountain range on the left. Then turn left onto an asphalt road for about 7.5 kilometres and continue on foot around 2 kilometres up the mountain to the peak to see the prehistoric drawings. The total distance from the city is around 51.6 kilometres. Getting There: From Amphoe Thap Than, take Highway No. 3013 to Amphoe Sawang Arom for approximately 11 kilometres. A 4-kilometre road leads to Ban Khok Mo. The weaving group is next to Wat Khok Mo. เดิมเป็นวัดที่สร้างในสมัยอยุธยา มีโบสถ์ขนาดเล็ก ภายในมีจิตรกรรมฝาผนังฝีมือช่างพื้นบ้าน เข้าใจว่าเขียนในสมัยหลังการสร้างวัด เป็นเรื่องพุทธประวัติ บางภาพต่อเติมจนผิดส่วน สมบัติอีกชิ้นหนึ่งของวัดคือ ธรรมาสน์ที่หลวงพ่อใหญ่สร้าง ที่วิหารมีพระปูนปั้นฝีมือพองามและมีลายไม้จำหลักขอบหน้าบันเหลืออยู่ 2 - 3 แห่ง ด้านตรงข้ามกับวัดเป็นปูชนียสถานแห่งใหม่ มีบริเวณกว้างขวางมาก พระราชมหาวีระ ถาวาโร (หลวงพ่อฤาษีลิงดำ) พระเถระที่มีชื่อเสียงได้สร้างอาคารต่าง ๆ มากมาย เช่น พระอุโบสถใหม่ ภายในประดับและตกแต่งอย่างวิจิตร บานหน้าต่างและประตูด้านในเขียนภาพเทวดาโดยจิตรกรฝีมือดี พระบาทสมเด็จพระเจ้าอยู่หัวเสด็จพระราชดำเนินมาตัดลูกนิมิตพระอุโบสถแห่งนี้ บริเวณโดยรอบสร้างกำแพงแก้วและมีรูปหล่อหลวงพ่อปาน และหลวงพ่อใหญ่ขนาด 3 เท่า อยู่มุมกำแพงด้านหน้า มณฑป และ พระวิหารแก้ว ที่ประดิษฐานพระพุทธชินราชจำลอง และศพของหลวงพ่อฤาษีลิงดำที่ไม่เน่าเปื่อย อาคารเหล่านี้ส่วนใหญ่จะมีลักษณะภายนอกที่คล้ายคลึงกันคือสร้างด้วยโมเสกสี ขาวใสดูเหมือนแก้ว และยังมีปราสาททองคำ ศาลาฝึกสมาธิ อาคารแต่ละหลังจะมีเวลาเปิด-ปิดไม่ตรงกันและปิดช่วงกลางวัน วิหารแก้วจะเปิดให้ชมตั้งแต่เวลา 9.00-11.45 น.และ 14.00-16.00 น.